Q - How do I register the PhotoRescue Wizard demo version? A - by downloading the current demo version and replacing your current version. The key you have purchased will activate new versions of PhotoRescue 3.x for at least a year after you have made the initial purchase. Note: at this point, October 2008, all customers who have purchased since March 2007 are still in their free update period. Q - Is PhotoRescue Wizard 3.x for Mac OS X compatible with Leopard? A - All versions of PhotoRescue 3.x released after Sept 1, 2007 are fully compatible with Mac OS X Leopard. Please download the latest versions from here if the version you have was released before the release of Leopard and doesn't start. Q - can damaged jpeg/raw files be fixed? A - in general, the answer is NO. That's why PhotoRescue focuses on the recovery of correct files from the original media. Please read this for more information about the issue of damaged files. Q - can overwritten data be recovered? A - When old data has been overwritten by new data, the old data is not recoverable, by any means, sorry about that. If it was recoverable, we would have found a way to at least double the capacity of the cards on the market... (and we wouldn't be selling data recovery software, but card doublers, a much larger market!) In some cases, old data may be recoverable when it should have been overwritten by new data: this is simply because cards sometimes reshuffle the locations of their memory banks and the old data was moved to a place that was not overwritten by new data. Q - can PhotoRescue recover files from my hard drive? A - PhotoRescue can recover data from hard drives but it will not recover data from system hard drives or partitions (system hard drives or partitions from which your computer is started). The reason is that lost data is found in unallocated space and that system drives are constantly being written to. Using or installing programs on drives where data has been lost can only lead to further permanent data loss because the data that was retrievable will be overwritten. If your computer is a PC, you can usually transfer the drive you want to recover from into an external enclosure or into another PC, as a slave drive. If your computer is a Mac, the machine where data has been lost can be started in target mode and used, for the purpose of recovery as an external drive. Q - What are CIB files? A - CIB files, in other words, "Card Image Backups" files are bit by bit copies of the media to recover. Data can be recovered from them just as if they were the original media. Use CIB files when you want to speed up the recovery, when you want to create a backup or when you absolutely need to reuse a card that needs recovery. Q - PhotoRescue locks up while analyzing a damaged device, what do I do? A - the program may have encountered an area of the drive where an unrecoverable hardware error occurs. DRDD (see below), our free data-recovery oriented disk imager may help create a partial disk image that PhotoRescue could use. Q - May I keep both PhotoRescue Expert 2.x and Wizard 3.x on my computer? A - Yes, the presence of PhotoRescue 2.x does not conflict with version 3. PhotoRescue 3.x will not erase PhotoRescue 2.x However, one should not run both versions of PhotoRescue simultaneously on the same card. Q - How can I tell if PhotoRescue Wizard 3.x is registered? 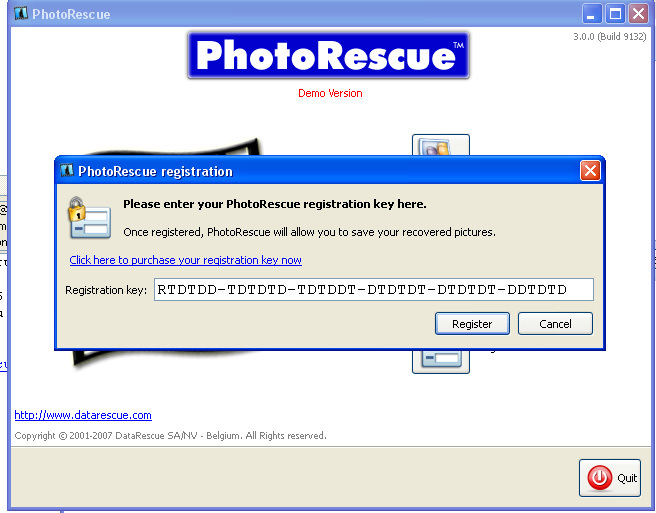 A - PhotoRescue 3.x doesn't display the name of its owner: it displays a "Registered Version" label under its logo. We can, if necessary, connect the key to the licensee. Q - Where can I download older versions of PhotoRescue Wizard 2.x? A - The old versions can be downloaded through these link: Mac OS X /Windows. Please note that the older versions do not accept the current activation code and vice versa. If you have lost your activation code as well, please contact [email protected] with either the e-mail address used for the purchase or the order number. Download DRDD, a freeware data-recovery oriented disk imager for Windows PC or Mac OS X. DRDD creates CIB or DD backup files which can be used as backups or as recovery starting points for PhotoRescue.